I recently posted about how I came to like the Civil War and what in my background might have influenced (or still influence) my viewpoints on it. See the link here. After publishing it, I thought of a few other things that I wanted to add. When I was about 10 years old, I read an article in the Kentucky Post (which no longer even exists) about William Corbin and Jefferson McGraw. This story of something so local (I lived near where they were caught and very close to their burial places) from the Civil War stuck in my head and was something I never forgot. Years later, I went to college and wanted to read the story again. I was lucky enough to find the article by searching through page after page of microfilm, (not quite as quick or easy as Google or Yahoo are now.) I included one link of the story above, but there are plenty more available, though much of the information is probably very similar. I believe this is a transcription of the actual article that originally caught my attention. Their story is a fascinating one, at least for me, especially once I learned that this incident eventually led Union officials to threaten the execution of Robert E. Lee's son Rooney, who had been captured in the summer of 1863. That was not in the original story I first saw. My understanding is that the small, private family cemetery where Corbin is buried is now cleaned up and fenced in, thanks to the property owner, but the last time I visited the church cemetery where McGraw is buried, it was a mess, though McGraw's marker was in fine overall condition. 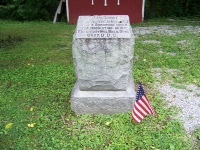 Here are two photographs I took of McGraw's monument a few years ago. I do not know why an American flag was placed by it. It reads: "Lt. T.J. McGraw C.S.A. shot at Johnson's Is. 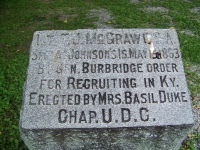 May 15, 1863 by S. N. Burbridge order for recruiting in Ky. Erected by Mrs. Basil Duke chap. U.D.C." An interesting aspect of the story is that the monument states that he was shot under General Stephen "Butcher" Burbridge's order, but that general was not in charge in Kentucky until early 1864, months after their arrests and execution. Ambrose Burnside was in command in the region (office in Cincinnati) when Corbin and McGraw were arrested and executed. Of course, one controversy was that they were arrested under Burnside's General Order Number 38, issued days after their arrest. With the recent controversy over the Confederate battle flag still hanging on, I must say that I was a big fan of the television show The Dukes Of Hazzard as a child, but do not believe I connected items like the General Lee (and its roof) and J.D. (Jefferson Davis) "Boss" Hogg with the war, though I seem to recall one episode with Boss' brother Abraham Lincoln Hogg appearing, wearing all black in contrast to Boss' all white suit. I just thought it was a cool show, especially the car jumps (yeeeee-haw) and the dynamite arrows that blew stuff up. It had a great theme song too. It was just a fun show and I do not believe it influenced my interest in the war at all. I do feel TVLand is overreacting a bit with its decision to stop airing it, though I suppose that is their right. Something else that grabbed my attention came just a few years ago when a cousin, who has an incredible knowledge of family history, informed me that we did have ancestors in the war. I liked both genealogy and the Civil War but had never been able to join the two together, so this was extremely welcome news to me. Here is a post I wrote about two of my great-great-great-grandfathers, Nimrod McIntosh and Henderson Turner. My original research, however, was not very good and I need to make updates and correct some of the information in it, which I will do in a separate post which will also include information on some other ancestors, including a couple of recent discoveries. I may also put together some thoughts and ideas on how or if living in Kentucky - a Union state with Southern ties - may have influenced my viewpoints and affected my interest in the war.